Valley of Megiddo is a sacred land in Israel that flourishes with harvests and trees. As prophesied by the Book of Revelation, it is to be the location of a gathering of armies for the last battle, Armageddon. My neighbor was going to throw out a gate from his old farm somewhere out in the countryside of Texas. 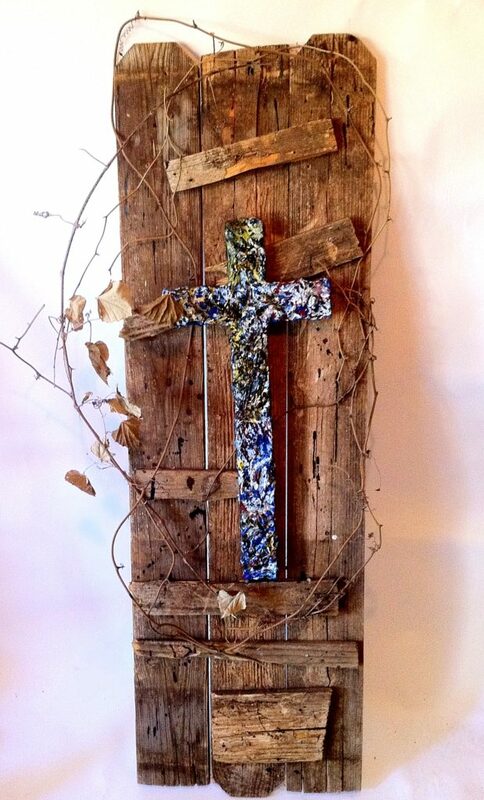 So I scooped it up, split it into two (it’s pairing is Road to Armageddon), and added pieces of wood rails and one of my favorite large crosses. The swaddled grapevine around the gorgeous blues makes me think of tall blue spruce pines- with their perfume and power.